The Parachicos dance is most famously performed in the town of Chiapa de Corzo in the Mexican state of Chiapas. It is said to honor three Catholic saints—Saint Anthony, Our Lord of Esquipulas, and Saint Sabastian. The costumed dancers wear wooden masks with bearded Caucasian faces, they carry handmade tin maracas that are painted silver, and on their heads are headdresses made of woven ixtle (or istle), a fiber obtained from the agave or yucca plant. These headdresses are decorated with colored ribbons. 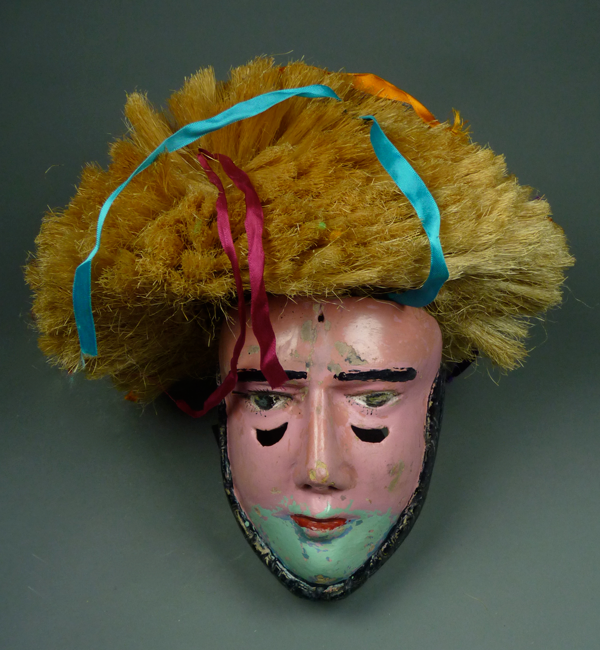 Here is a mid-20th century Parachicos mask with its ixtle headdress. A continuous band of carved hair, which represents the sideburns and beard, provides a stylized design that frames the face of a Parachicos mask. Unlike those that follow, this one has relief carved eyes, rather than inlaid ones made of glass. Like the later masks, this one does have applied eyebrows, but just on the right eye. 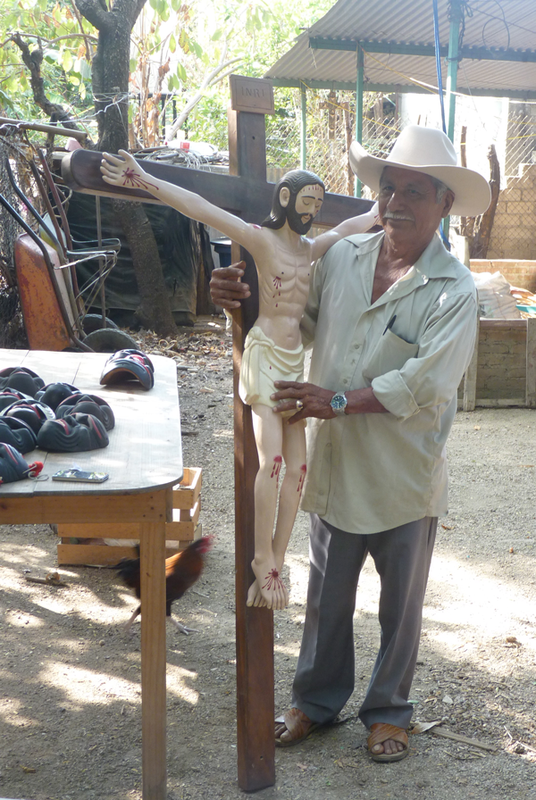 Two weeks ago I introduced a wonderful living carver, Ladislao López Ortiz of Pinotepa Nacional, Oaxaca. 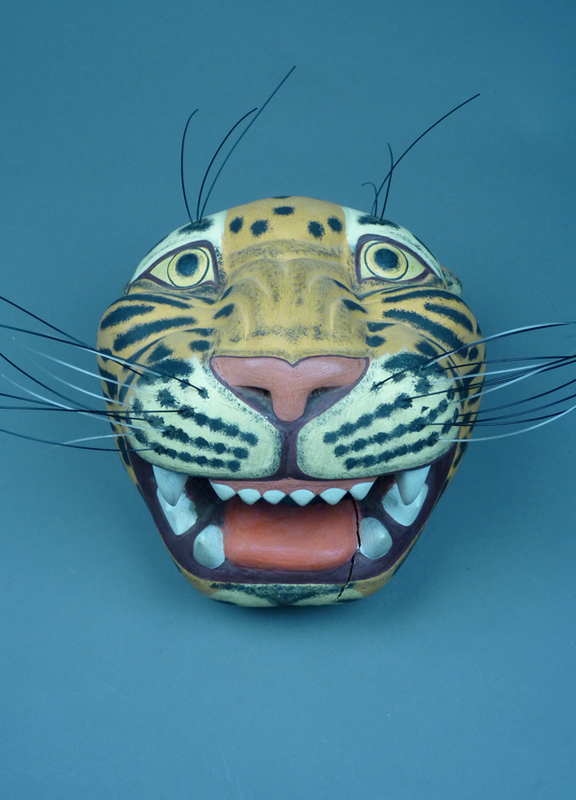 In that post and the next I focused on his Negrito masks, along with some masks by other carvers; today I want you to see other masks, particularly his masks of Tigres (jaguars). Here is one of those. 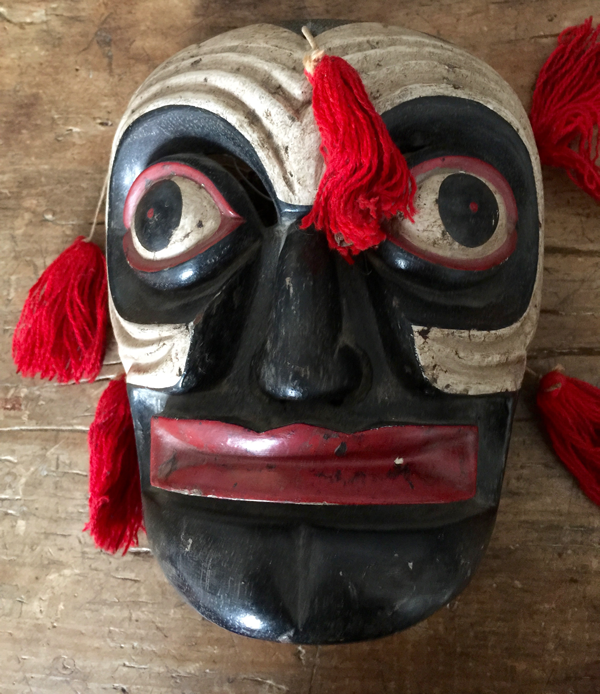 I purchased this mask from Ladislao in 2006; he had carved it in 2000. There is a crack in the jaw that extends to the back edge; this appeared after I had brought the mask back to my centrally heated house in Pennsylvania. Everything that you see was carved from a single block of wood. It has good lines and it has been carefully painted. On June 1, 2015 I told of traveling to the Mixtec villages on the coast of Oaxaca to visit a family of traditional carvers. I introduced you to the masks of the late Filiberto López Ortiz. Last week I told about Filiberto’s brother Ladislao López Ortiz, another master carver in Pinotepa Nacional who is still actively carving. These discussions prompted Randell Morris to send me photos of four masks in his collection that seemed similar to those I had included. Here is the first of these masks. One is immediately impressed by the quality of the carving and the patina. This is a Black/White Negrito mask, a near duplicate of the mask I showed last week that was carved by Ladislao López Ortiz. I call your attention to some characteristic details—the finely carved protruding eyes, the grooved whirling chevron designs on the cheeks, the finely carved nose, the stylized mouth, and the cleft chin. 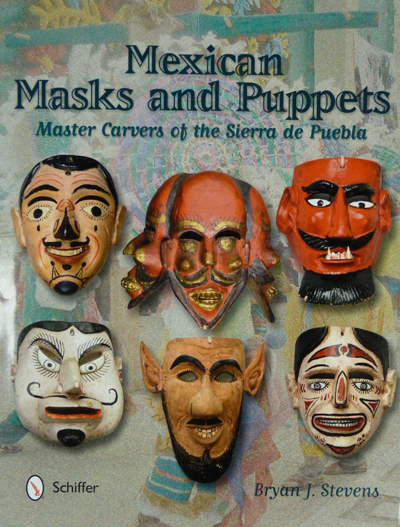 Last week I began to tell about a trip to the Costa Chica of Oaxaca that focused on some of the carvers and their masks. I began with a visit to the family of the late Filiberto López Ortiz. This week I want to introduce you to Ladislao López Ortiz, the brother of Filiberto. Lao (short for Ladislao) is less widely known, but he remains one of the best carvers from this area. Here is a photo of Lao with a wooden crucifix that he has carved by hand. On the table are about a dozen of his Negrito masks. Carnaval (carnival in English), the celebration that we also know as Mardi Gras, occurs each year, on or around Shrove Tuesday, the day before Ash Wednesday. In the Mixtec villages along the Pacific coast of the Mexican state of Oaxaca, these masked fiestas tend to occur over a period of days before Ash Wednesday. This year, as we have often done in the last few decades, my wife Lucy and I traveled to Puerto Escondido, Oaxaca, so that we could travel up the coast to revisit and research these dances. 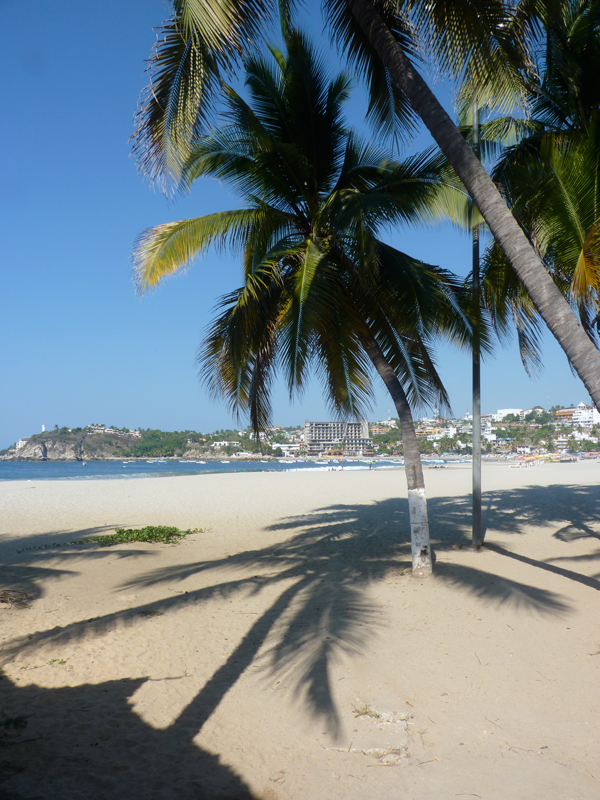 Here is the view from the beach in front of our room in Puerto Escondido. We could choose between this quiet stretch of ocean, a section of pipeline surf several hundred yards to the viewers left, or a peaceful swimming pool next to our bungalow. 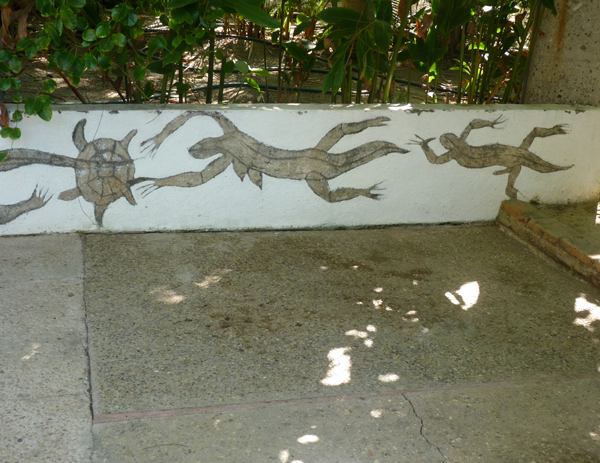 On a low wall behind the swimming pool, the Mexican artist Alejandro Colunga has left a zoology lesson.